Tourism is one of the world’s fastest growing industries and a major foreign exchange and employment generation for many countries. It is one of the most remarkable economic and social phenomena. [tie_index]Definations[/tie_index]The world ‘tour’ is derived from the Latin word tornus, meaning ‘a tool for making a circle’. Tourism may be defined as the movement of the people from their normal place of residence to another place ( with the intention to return) for a minimum period of twenty-four hours to the maximum of six months for the sole purpose of leisure and pleasure. The Rome conference on tourism in 1963 defined tourism as ‘ a visit to a country other than one’s own or where one usually resides and works’. This definition, however, did not take into account domestic tourism, which has become an important money-spinner and job generator for the hospitality industry. The UNWTO defines tourists as ‘ people who travel to and stay in place outside their usual environment for not more than one consecutive year for leisure, business and other purposes not related to the exercise of an activity remunerated from within the place visited’. According to the Tourism Society of Britain,” tourism is the temporary short-period movement of people to destination outside the places where they normally live, work; and activities during their stay at these destinations.” This definition includes the movement of people for all purposes. The development of technology and transportation infrastructure, such as jumbos jets, low-cost airlines, and more accessible airports have made tourism affordable and convenient. There have been changes in lifestyle – for example, now retiree-age people sustain tourism around the year. The sale of tourism products on the internet, besides the aggressive marketing of the tour operators and travel agencies, has also contributed to the growth of tourism. September 27 is celebrated as world tourism every year. This date was chosen as on that day in 1970, the Statutes of UNWTO were adopted. The purpose of this day is to raise awareness of the role of tourism within the international community. Travel is as old as mankind on the earth. The man at the beginning of his existence roamed about the surface of the earth in the search of food, shelter, securities, and better habitat. However, in course of time, such movements were transformed into wanderlust. About five thousand year ago, changes in climate, dwindling food and shelter conditions hostile invaders made the people leave their homes to seek refuge elsewhere like the Aryans left their homes in Central Asia due to climate changes. Perhaps, this leads to the development of commerce, trade, and industry. During Hindu and Chinese civilization a movement of religion, education and culture began. Christian missionaries, Buddhist monks and other traveled far and wide carrying religious messages and returned with fantastic images and opinions about alien people. For centuries movement of people continued to grow due to the efficiency of transport and the assistance and safety which the people could travel. By the end of the 15th century, Italy had become the intellectual and cultural center of Europe. It represented the classical heritage both for the intelligentsia and the aristocracy. During the 16th Century, travel come to be considered as an essential part of the education of every young Englishman. Travel thus became a mean of self – development, and education in its broadest sense. The educational travel was known as ‘Grand Tour‘. The industrial revolution brought about significant changes in the pattern and structure of British society. Thus, the economy of Britain was greatly responsible for the beginning of modern tourism. It also created a large and prosperous middle class and because of great improvement in transportation systems in latter half of the 18th century and the first quarter of the 19th century, increasing number of people began to travel for pleasure. Travel was originally inspired by the need for surviving (food, shelter, and security), the desire to expand trade and quest to conquer. As transportation system improved the curiosity for transforming the vast and virgin world into a close neighborhood created a new industry i.e. Travel and Tourism. However, the developments of rails, roads, steamships, automobiles, and airplanes helped to spread technology across the globe. Earlier travel was a privilege only for wealthy people but with the industrial revolution, the scenario altogether changed. Transportation, as well as accommodation, became affordable to middle and working class citizens. Essentially, with the development of jet travel, communication, new technology, tourism, and travel became the world’s largest and fastest growing industry. Travel and tourism, recently has emerged as a dominant economic force on the global scene accounting for more than 12% of total world trade and growing at the rate of 8 percent annuals. Tourism has two types and many forms on the bases of the purpose of visit and alternative forms of tourism. Tourism can be categorized as international and domestic tourism. When people visit a foreign country, it is referred to as International Tourism. In order to travel to a foreign country, one need a valid passport, visa, health documents, foreign exchange, etc. International tourism further divides into two types; Inbound Tourism & Outbound Tourism. This refers to tourists of outside origin entering a particular country. When people travel outside their host/native country to another country, then it is called inbound tourism for that country where he/she is traveling. For example when a tourist from Indian origin travels to Japan then it is Inbound tourism for Japan because foreign tourist comes to Japan. This refers to tourists traveling from the country of their origin to another country. When tourists travel a foreign region than it is outbound tourism for his own country because he/she is going outside their country. For example when a tourist from India travel to Japan then it is outbound tourism for India and Inbound tourism for Japan. The tourism activity of the people within their own country is known as domestic tourism. Traveling within the same country is easier because it does not require formal travel documents and tedious formalities like compulsory health check and foreign exchange. In domestic tourism, a traveler generally does not face much language problems or currency exchange issues. 1) Recreational: Recreational or leisure tourism takes a person away from the humdrum of everyday life. In this case, people spend their leisure time at the hills, sea beaches etc. 2) Cultural: Cultural tourism satisfies the cultural and intellectual curiosity and involves visits to ancient monuments, places of historical or religious importance, etc. 3) Sports/Adventure: Trips have taken by people with a view to playing golf, skiing and hiking, fall within this category. 4) Health: Under this category, people travel for medical, treatment or visit places where there are curative possibilities, for example, hot springs, spa yoga, etc. 5) Convention Tourism: It is becoming an increasingly important component of travel. People travel within a country or overseas to attend conventions relating to their business, profession or interest. 6) Incentive Tourism: Holiday trips are offered as incentives by major companies to dealers and salesmen who achieve high targets in sales. This is a new and expanding phenomenon in tourism, These are in lieu of cash incentives or gifts, Today incentive tourism is a 3 billion dollar business in the USA alone. Tourism as a socio-economic phenomenon comprises the activities and experiences of tourists and visitors away from their home environment and serviced by the travel and tourism industry and host destination. The sum total of this activities experience and services can be seen as the tourism product. The tourism system can be described in term of supply and demand. Tourism planning should strive for a balance between demands and supply. This requires an understanding not only of market characteristics and trends but also of the planning process to meet the market needs. Often tourist from core generating markets are identified as the demand side; the supply side includes all facilities, programmes, attraction, and land uses designed and managed for the visitors. These supply-side factors may be under the control of private enterprise, non-profit organizations, and government. New and innovative forms of partnerships are also evolving to ensure the sustainable development and management of tourism related resources. The supply and demand side can be seen to be linked by flows of resources such as capital, labor, goods and tourist expenditures into the destination, and flows of marketing, promotion, tourist artifacts and experiences from the destination back into the tourist generating region. In addition, some tourist expenditures may leak back into the visitors generating areas through repatriation of profits of foreign tourism investors and payment for improved goods and services provided to tourists at the destination. Transportation provides an important linkage both to and from the destination. Various modes of transportation and other tourism-related infrastructure. The community of communities within the visitor’s destination area. The political and institutional frameworks for enabling tourism. The tourism system is both dynamic and complex due to many factors linked to it and because of the existence of many sectors contributing to its success. These factors and sectors are linked to the provision of the tourist experience and generation of tourism revenue and markets. The dynamic nature of tourism system makes it imperative to scan the external and internal environment of the destinations on a regular basis so as to makes changes when necessary to ensure a healthy and viable tourism industry. Thus, it is now an accepted fact that tourism development can no longer work in isolation of the environment and the local communities, nor can it ignore the social and cultural consequences of tourism. Tourism and hospitality, which are inextricably linked to each other, are among the major revenue-earning enterprises in the world. They happen to be among the top employers too. There has been an upmarket trend in tourism over the last few decades as travel has become quite common. People travel for business, vacation, pleasure, adventure or even medical treatments. Tourism spurs infrastructure development. In order to become an important commercial or pleasure destination, any location would require all the necessary infrastructure, like good connectivity via rail, road, and air transport, adequate accommodation, restaurants, a well-developed telecommunication network, and, medical facilities, among others. The people who travel to other countries spend a large amount of money on accommodation, transportation, sightseeing, shopping etc. Thus, an inbound tourist is an important source of foreign exchange for any country. The World Travel and Tourism Council (WTTC) predict in 1997 that the twenty-first-century economy would be dominated by three industries: telecommunications, information technology, and tourism. The travel and tourism industry has grown by 500 percent in the last 25 years. Now withstanding this bright outlook and prospects, the tourism and hospitality industries are very vulnerable to the fluctuations of national economies and happenings in the world, especially terrorist attacks that have at times dealt severe blows to business. In recent years, there have been a few setbacks in tourism, such as the terrorist siege of the Taj and Oberoi in Mumbai, India (26 November 2008); the attack of the World Trade Centre in the United States of the America (11 September 2001); bombing in a hotel on the Indonesian island of Bali (12 October 2002); tsunami in Southeast Asia and South Asia on 26 December 2004, in which thousands of the lives where lost and consequently tourism was hit. Nonetheless, the sector is now getting back to business. Establishing or developing a tourism industry involves expenditure as well as gains, costs, and benefits. If these impacts are taken into consideration from the outset of planning, strengths and opportunities can be maximized while weaknesses and threats can be minimized. Each destination will be different in terms of tourism characteristics. The cost and benefits of tourism will vary in each destination and can change over time, depending on tourism and other activities in a destination’s local and regional context. Tourism activities impact the economy of the country as well as the local economy of the destination. Tourism generates local employment, directly in the tourism sector and in support and resource management sectors. Tourism stimulates profitable domestic industries, hotels and other lodging facilities, restaurants and food services, transportation systems, handicrafts, and guide services. Tourism generates foreign exchange for the country and injects capital and new money into the local economy. Tourism helps to diversify the local economy. Increase tax revenues from tourism. Higher demand created by tourism activity may increase the price of land, housing and a range of commodities necessary for daily life. Demands on health services provision and police service increase during the tourist seasons at the expense of the local tax base. Tourism also affects the society of the destination in good as well as bad ways. It benefits and costs the local communities. The quality of a community can be enhanced by economic diversification through tourism. Recreational and cultural facilities created for tourism can be used by local communities as well as domestic/international visitors. Public spaced may be developed and enhanced through tourism activity. Tourism Enhances local community’s esteem and provides an opportunity for greater understanding and communication among people of diverse background. Rapid tourism growth can result in the inability of local amenities and institutions to meet service demands. Without proper planning and management, litter, vandalism, and crime often accompany tourism development. Tourism can bring overcrowding and traffic congestion. Visitors bring with them material wealth and apparent freedom. The youths of the host community are particularly susceptible to the economic expectations these tourists bring and can result in complete disruption of traditional community ways of life. The community structure may change, e.g. community bonds, demographics, and institutions. The authenticity of the social and cultural environment can be changed to meet tourism demands. Tourism activities also affect the culture of the host country. There are many positive and negative cultural impact of tourism. Tourism can enhance local cultural awareness. Tourism can generate revenue to help pay for the preservation of archaeological sites, historic buildings, and districts. Despite criticism about the alteration of cultures to unacceptable levels, the sharing of cultural knowledge and experience can be beneficial for hosts and guests of tourism destinations and can result in the revival of local traditions and crafts. Youth in the community begin to emulate the speech and attire of tourists. Historic sites can be damaged through tourism development and pressures. There can be long-term damage to cultural traditions and the erosion of cultural values, resulting in cultural change beyond a level acceptable to the host destination. Tourism impacts on the environment in positive as well as negative way. These impacts are following below. Parks and nature preserves may be created and ecological preservation supported as a necessity for nature-based tourism. Improved waste management can be achieved. Increased awareness and concern for the environment can result from nature-based tourism activities and development. A negative change in the physical integrity of the area. Rapid development, over-development, and overcrowding can forever change the physical environment and ecosystems of an area. Degradation of parks and preserves. Over the years, tourism has become a popular global activity. Depending upon the nature and purpose of their travel, tourists, need and demand certain facilities and services. This has given rise to a wide range of commercial activities that have acquired industry proportions. Thus travel and tourism now days represent a broad range of related industries. Hotels are the commercial establishment that provides accommodation, meals, and other guest services. In travel and tourism industry, the hotel industry plays a very significant role, as all tourists need a place to stay at their destinations, and require many more services and facilities to suit their specific needs and tastes. Restaurants are retail establishments that serve prepared food and beverages to customers. In the travel and tourism industry, restaurants and other food and beverage outlets are very important as tourists like to experiment with local cuisines of the places they are visiting. The retail industry is very important as tourists shop for their day to day necessaries as well as look for mementos and souvenirs. In the recent years, some cities in the world have been promoted as shopping destinations to attract people with a penchant for shopping by offering various products, such as garments, electronic goods, jewelry, and antiques. New York, Paris, London, and Milan in Italy are famous as fashion havens of the world. It is the movement of people and goods from one place to another. A well-developed transport industry, as well as infrastructure, is integral to the success of any travel and tourism enterprise. A travel agency is a retailing business that sells travel related products and services, particularly package tours, to customers on the behalf of suppliers such as airlines, car rentals, cruise liners, hotels, railways, and sightseeing. Travel agencies play a very important role as they plan out the itinerary of their clients and make the necessary arrangements for their travel, stay, and sightseeing, besides facilitating their passport, visa, etc. 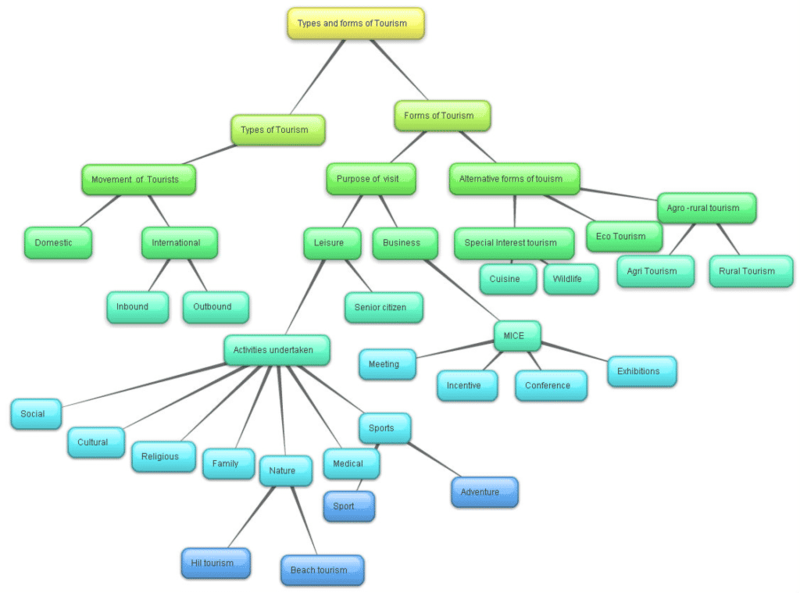 A tour operator assembles the various elements of a tour. It typically combines tour and travel components to create a holiday. Tour operators play an important role in the travel and tourism industry. A tourist attraction is a place of interest for tourists, typically for its inherent or exhibited cultural value, historical significance, nature or build beauty or amusement opportunities. 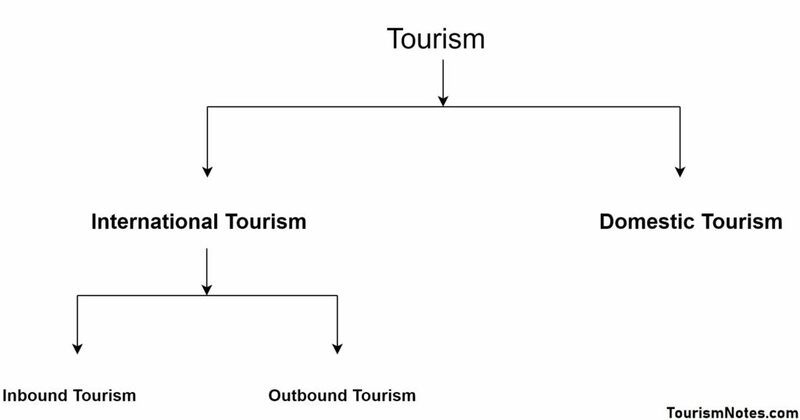 These are the basic fundamentals of the tourism industry. Cultural or creative industries are responsible for the creation, production, and distribution of goods and services that are cultural in nature and usually protected by intellectual property rights. As tourists like to visit places of cultural significance and soak in the culture of the area, the cultural industry is very important to travel and tourism. Leisure or free time is a period of a time spent out of work and essential domestic activity. Recreation or fun is spending time in a manner designed for therapeutic refreshment of body or mind. While leisure is more like a form of entertainment or rest, recreation requires active participation in a refreshing and diverting manner. As people in the world’s wealthier regions lead an increasingly sedentary lifestyle, the need for recreation has increased. These play a significant role in the travel and tourism sector. A tourism/tourist product can be defined as the sum of the physical and psychological satisfaction it provides to tourists, during their ‘traveling and sojourn’ en route at the destinations. Since travel and tourism industry is an agglomeration of too many sectors that promote travel related services. These sectors are referred to as travel vendors and their services and goods are called ‘travel products’. A tourism product includes five main components such as physical plant, services, hospitality, freedom of choice, and a sense of involvement. Thus, whatever the natural and man-made resources, services brought about the consumption of tourists is called tourism products. 1) Intangible: Tourism is an intangible product means tourism is such kind of product which can not be touched or seen and there is no transfer of ownership, But the facilities are available for specified time and for a specified use. For e.g. a room in the hotel is available for a specified time. 2) Psychological: The main motive to purchase tourism product is to satisfy the psychological need after using the product, by getting experience while interacting with a new environment. And experiences also motivate others to purchase that product. 3) Highly Perishable: Tourism product is highly perishable in nature means one can not store the product for a long time. Production and consumption take place while a tourist is available. If the product remains unused, the chances are lost i.e. if tourists do not purchase it. A travel agent or tourism operator who sells a tourism product cannot store it. Production can only take place if the customer is actually present. And once consumption begins, it cannot be stopped, interrupted or modified. If the product remains unused, the chances are lost i.e. if tourists do not visit a particular place, the opportunity at that time is lost. It is due to tourism reason that heavy discount is offered by hotels and transport generating organizations during the offseason. 4) Composite Product: Tourist product is a combination of different products. It has not a single entity in itself. In the experience of a visit to a particular place, various service providers contribute like transportation The tourist product cannot be provided by a single enterprise, unlike a manufactured product. The tourist product covers the complete experience of a visit to a particular place. And many providers contribute to the tourism experience. For instance, airline supplies seats, a hotel provides rooms and restaurants, travel agents make bookings for stay and sightseeing, etc. 5) Unstable Demand: Tourism demand is influenced by seasonal, economic political and others such factors. There are certain times of the year which see a greater demand than others. At these times there is a greater strain on services like hotel bookings, employment, and the transport system, etc.